A delicious and creamy slow cooked chicken alfredo with pasta and broccoli. EVERYTHING gets cooked in the crockpot – the chicken, pasta, broccoli, and sauce so there is no need for separate pots/pans! So, there has been quite a love affair with Alfredo at my home as of late. TWO Chicken Alfredo dishes on the blog in the same month– when in the almost two years I’ve been blogging I’ve never even had one! Growing up, anything Alfredo was my absolute favorite. I’ll take a white creamy sauce over a red sauce any day. However, my husband has never really been a huge fan of them and my little boy is completely obsessed with anything that has a red sauce. So red sauces tend to get used and I’d really forgotten how good a creamy Alfredo dish could taste. Between this super simple crockpot Alfredo recipe, and my one pot skinny Alfredo dish, I’ve converted the boys in my family to all things Alfredo. To say I’m excited about this is quite the understatement. Bring on the creamy Alfredo!! One of the reasons this dish is SO easy and only requires one pot (the crockpot) is because I’m using a pre-made Alfredo sauce by Prego. For this dish, I used their Roasted Garlic Parmesan because I love the extra garlicky flavor. This sauce has such a rich flavor and uses real ingredients (such as fresh cream). I love this sauce because of the authentic and delicious taste, but also because it makes this dinner come together in a flash. As much as I enjoy making a homemade Alfredo sauce, days get busy and being able to use a jar of Alfredo makes dinner prep so much easier! And wow is this dinner easy — the chicken, pasta, and broccoli ALL get cooked in the crockpot so you don’t have to dirty a pot for the pasta, a steamer for the broccoli, or a pot to make a homemade sauce. 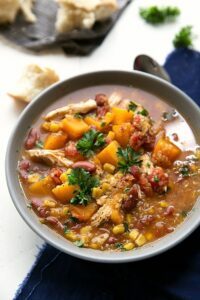 As with all slow cooker/crockpot dishes, each crockpot is a little different. Some will cook hotter and faster while some cook slower and at a lower temperature. Just make sure to watch your dish carefully so that it doesn’t get overdone. When the pasta is al dente or cooked how you like it, the broccoli is crisp and tender, and the sauce is thick and creamy — you know dinner is ready! The extra “garnishing” really makes this dish shine — be generous with some extra seasonings. I love using a lemon-pepper seasoning, fresh cracked pepper, a little seasoned salt, lots of fresh parsley, a tiny bit of red pepper flakes (if you like the touch of heat), and an additional sprinkle of Parmesan cheese. You could also cube up some cream cheese and stir that into the dish if you like! And before you know it, with very little work on your part, you’ll have a restaurant-tasting Chicken Alfredo dish the whole family is going to LOVE! Spray the slow cooker with nonstick spray. Remove any fat from the chicken breasts and cut into large pieces. Place the pieces of chicken breast in the crockpot and cover with 1 cup of chicken broth. Place on low for 5-7 hours or high for 3-5 hours. The chicken should be completely cooked through. Drain the chicken breasts and shred in the crockpot with 2 forks. Add remaining 1 and 3/4 cups chicken broth, minced garlic, lemon pepper seasoning, ground pepper, jar of Alfredo sauce, and uncooked pasta to the crockpot. Stir well. In a small cup, stir together the cornstarch and water with a fork until smooth. Pour into the mixture and stir. Chop the broccoli into fairly small pieces. Place the chopped broccoli evenly on top of the mixture (Do not stir in. This will give the broccoli a “steamed effect” by placing it on top). Remove the lid and stir in the Parmesan cheese (add more to personal preference) and all optional seasonings. I generally add more pepper, salt, a sprinkle of red pepper flakes (a nice touch of heat and flavor) and freshly chopped parsley. *Cooking time and the liquid absorbed could vary depending on the pasta you use so I recommend sticking to regular rigatoni pasta. This recipe has not been tested with other forms of pasta (wheat or gluten free) so I can’t vouch for them working in this recipe. For other forms of pasta, cook separately and omit the additional chicken broth. Think that this can be doubled? Are we supposed to cover the crockpot wen we cook the chicken? Or cook it uncovered? Are we able to use frozen broccoli? I haven’t tried it, but I don’t see why it wouldn’t work. Enjoy! Is it ok if I forgot the cooking spray? How long does it take if you double the recipe? Can you put it on low? This one doesn’t double well and it’s best to keep it on high! The pasta doesn’t cook on low. Thank you!! Glad you enjoyed it! When you say drain the chicken, does that mean discard of the liquid that is in the pot before you shred the chicken then add the fresh chicken broth and remaining ingredients? How could I make this with shrimp instead of chicken? This looks so yummy!! I wanted to add a whole box of pasta though, because 2 cups is just not enough for us! Will this change the recipe at all? Okay thank you! So then I would have the sauce separately as well? I dumped the second half of the chicken broth and the cornstarch into the empty sauce jar, shook it vigorously and then added it. Saved having to try to scrape the jar and didn’t have to dirty a bowl to mix the cornstarch and water. Why do we use cornstarch in this please? Sorry, new at cooking. Thank you. I am making this soon!! Do you think I could just brown the chicken beforehand and just jump right to the second half of the recipe? I don’t have the 5-7 hours to cook the chicken. Can you substitute a chppped ham steak instead of chicken? I’m not exactly sure how the cooking process in the crockpot would differ, but I know the ham would cook quite differently than chicken. Wish I could be of more help. I haven’t tested steaming too many other veggies in the crockpot, so I can’t say for sure, but what about cauliflower? Spinach is good with alfredo also! I boiled my chicken in chicken broth. I then put my sauce prego garlic, in a big skillet added minced garlic added the lemon pepper and black pepper, and let that simmer. I then added my chicken while my noodles boiled. Once they were done I I used the steamed bag of broccoli that u microwaved. It It was delish! Quick version for those that don’t want to use the crock pot!!! Made this tonight and it turned out great! this Food I like it…yummy…. I only have medium shells to use instead of rigatoni…what do you think? 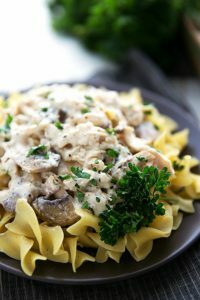 I absolutely love Alfredo and this recipe is awesome! However, my husband is not a fan of rigatoni or penne pasta, but he does love bow tie pasta. Can I use that instead, or should I cook it separately?